The map includes a splash screen with a video introduction from the Director of the San Francisco Department of the Environment. The map itself shows all the present solar installations in the city, colour coded by type of building. The truly amazing feature of this map though is that you can type in any address in the city and get a detailed breakdown of the property's solar potential. If you live in San Francisco you can type your address into a search box. 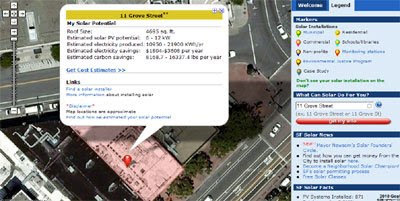 The roof of your home is then shaded on the Google Map and an information window opens showing your roof size (in square feet), the estimated solar potential, the estimated electricity production, your estimated electricity savings in dollars per year and the estimated carbon saving you will make. If you click on the '+' symbol on the information window you will even get an estimated breakdown of how much it would cost to install solar panels on your property. This is definitely one of the best Google Maps of the year and has been released just in time to make the The Best Google Maps of 2008 list. Via: Time (although they don't know the difference between Google Maps & Google Earth).